A resilient facility will suffer minimal damage during a disaster, and will recover quickly following an event. We have learned the hard way what is needed to make a facility resilient by restoring facilities that have been damaged by disasters including fires, hurricanes, flooding and the collapse of the World Trade Towers. This experience, sometimes brutal, has taught us practical, simple things that a manager can do to make their facility more resilient. We offer the services needed to prepare a Disaster Preparedness Plan, this starts with very simple and inexpensive measures that will ameliorate the impact of a disaster, and may then require capital expenditures to ruggedize equipment or buildings. We develop cost estimates and can assist in the preparation of a capital improvement plan that prioritizes improvements to the criticality of the equipment, and is coordinated with routine equipment replacement. First – Backup Drawings and Documents: Scan drawings, specifications, equipment manuals, process diagrams into electronic form and get a copy off site. We have frequently been called to rehabilitate a facility where the drawings were in the basement and destroyed by the flood, or in the 40th floor mechanical room and rendered unreadable by smoke damage during the fire. Access to drawings greatly facilitates emergency response such as shoring, pumping out flooded areas, stabilizing damaged equipment, etc. We can advise about the documents to scan, scan them for you, and manage redundant storage of electronic files with backups. Next – Facility Assessment: We inspect the facility, and evaluate its construction and equipment to determine each component’s ruggedness, when confronted with a disaster. Systems such as, mechanical, electrical, plumbing, data and power are evaluated for criticality to operation of the facility. Information gathered in this phase of the planning is used to inform prioritization of interventions applied to systems, and development of scheduled improvements needed to boost resilience. As a bonus, this also provides a condition assessment of the facility that informs preparation of a capital improvement program to replace components prior to failure, and allows development of a preventative maintenance program. The saving resulting from planned replacement, and preventative maintenance reduces the cost of ownership for the facility so much that the savings always exceed the cost of the assessment. 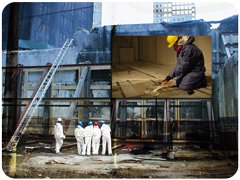 Site Conditions: Once the nature of the facility is understood, we evaluate the facility’s site to determine the risk of disaster from perils such as flood, wind damage, fire, power failure, infrastructure failure, surface and groundwater, chemical trespass, etc. Examples of the work that may be necessary during this phase of the investigation include determination of flood depths and comparison to floor elevations, and the elevation of critical equipment, evaluation of power reliability and redundancy of power transmission lines, elevations of roadways, modeling of wind flows due to geographical features or surrounding buildings. Operational Requirements: On industrial sites, we work with managers of the facility, and their engineers, to define systems and services that are critical to operation of the facility, and processes and equipment that would be damaged by events such as an unscheduled shut down, power loss either complete or of a phase, brownout, loss of water supply, flooding, etc. The Plan: Once the information gathering phase is complete, we work with the facility managers to develop a Disaster Preparedness Plan. This plan prioritizes actions needed to ruggedize the facility, and incorporates an estimate of costs, and provides a cost benefit analysis for each action. The plan takes into account the age and life expectancy of equipment so that, depending upon criticality, interventions can be incorporated into planned replacements of equipment as it reaches its life expectancy. The impact on disaster preparedness of delaying replacement of equipment until it has reached the end of its life cycle is analyzed by the plan. This allows an informed decision to be made regarding the competing interests of risk avoidance and cost. This potentially allows the Disaster Preparedness Plan to be more economically implemented. Also included in the plan, is the facility assessment which is the starting point for a scheduled preventative maintenance and replacement plan that will reduce the cost of facility operation.